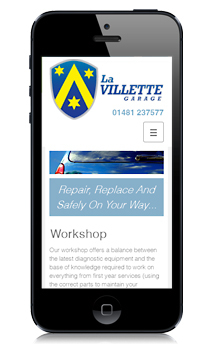 La Villette Garage is a friendly, small, family run garage located in Guernsey. They offer petrol and diesel, have fully qualified mechanics in their workshop and are sub contractors to Autoglass. 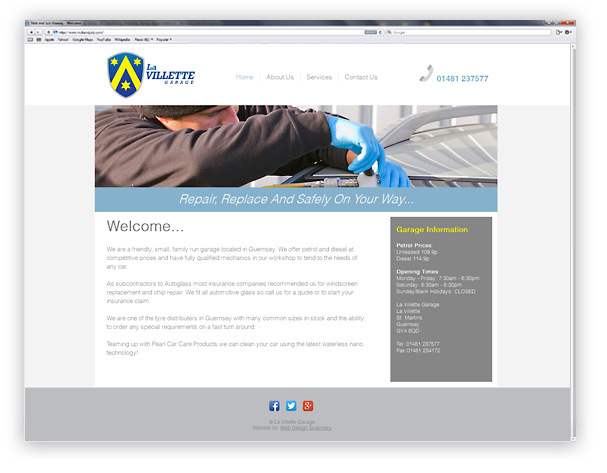 Click here to view the La Villette Garage Guernsey Website. I had free run on the design of the website and I based my design around the silver, blue, yellow and white colours that I had used in the redesign of the logo. The main menu bar at the top of each page utilises drop down menu options for the ‘Services’ section which highlights different aspects of work that the garage offers. This makes for easy navigation of the website and ensures that key pages are easy to find. 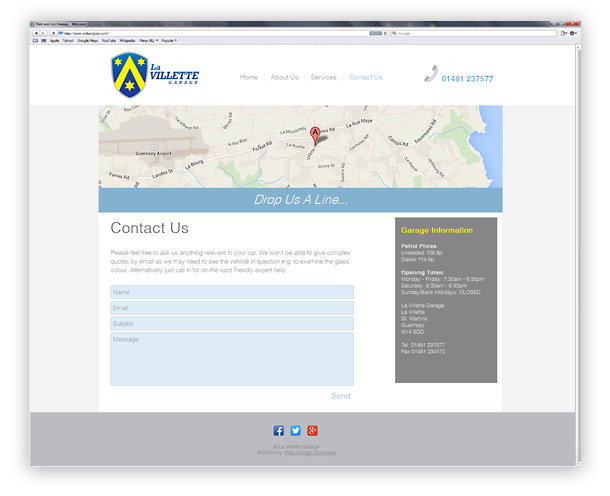 Each page contains a bold header photograph which illustrates the content of that page as well as the telephone number which is prominently displayed which makes it easy for people to get in contact easily. The website is optimised for mobile phones and tablets as well as computers. Mobile website design is essential for any business these days as mobile consumption of the internet is now overtaking traditional ‘desktop’ usage. The design of the site ensures that whether users are viewing the site on their iPhone or home PC, all content is readable and that the website is a breeze to navigate. La Villette Garage wanted to be able to update the website themselves so that information such as fuel prices could be regularly kept up to date and accurate. I based the website on a Content Management System which meant that they are able to update information, add new pages and content or links simply by logging in to the admin area of the website. 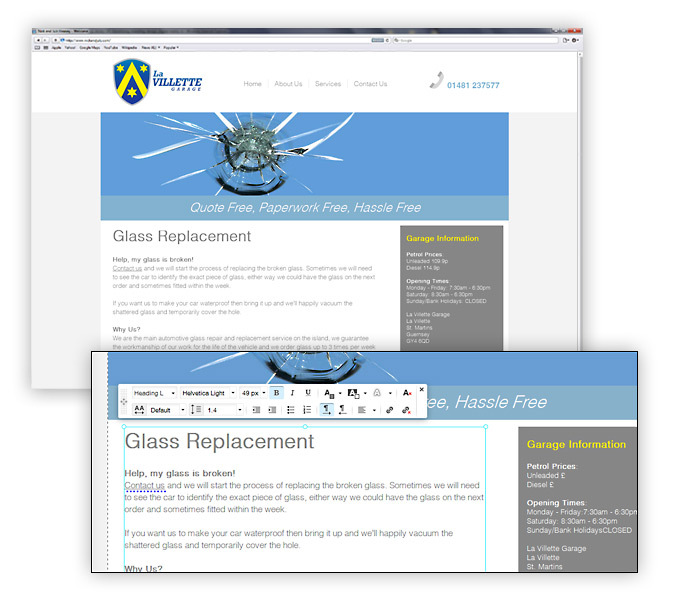 Any new content will follow the website design template that I created and the very user friendly CMS means that updating the website is straight forward and changes take seconds to make. These changes are live immediately meaning that the website content is always fresh and correct. La Villette Garage already had an existing logo which was made up of the Guille shield. I was tasked with updating the logo design whilst retaining this element. The shield was given a more modern feel with the addition of a blue gradient, rather than just a flat blue background. I also added the text ‘La Villette Garage’ to the right of the shield and added a silver stroke to both logo elements. One small quirk from the original logo that they wanted to roll over was a lower case ‘a’ on the word ‘La’, I implemented this into the design of the logo and it provides a nice continuity from the old to new logo version.